Margot Zemach's rough sketches are appropriately peasantlike in feeling, though they barely hint at the richness of this collection which has greater range and vitality than any of Singer's previous work for children. The comfortable silliness of the fools of Chelm, who sentence a disrespectful carp to death by drowning, Aunt Yentl's folk-wise tale of a household imp called the lantuch, and the triumph of Lemel, a simpleton swindled by everyone who makes a perfect marriage nonetheless, are joined here by two longer, autobiographical stories which reveal the young Isaac of Krochmalna Street as an inveterate dreamer, bursting with curiosity about the whys and wherefores of science and convinced that the secret, 24-letter name of the Messiah has been revealed to him in his sleep. 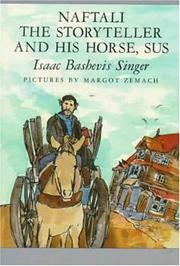 Where the boy Isaac in A Day of Pleasure (1969) was clearly projected through an older man's reminiscences, this one needs no mediator: he is at once a shameless little schemer and an incipient artist who, upon hearing the tall inventions of a garrulous traveling rabbi, bursts into tears from a mixture of awe, frustration, and envy. Eight sparkling tales in all, and every one begs to be read aloud. A delight.